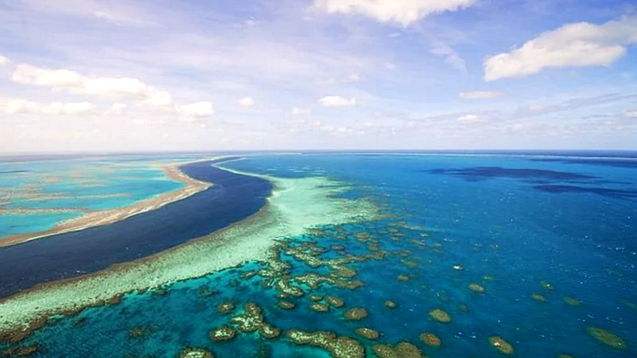 So-called geoengineering to draw down carbon dioxide or mask the effect of a warming planet has begun to draw science funding, including for three projects to protect Australia's largest network of coral reefs. However, "the current laws do not guarantee robust governance for field testing of these technologies," according to a paper published in the Climate Policy journal. "Nor do they provide the foundation for a more coherent national policy on climate intervention technologies more generally." Of the three reef-related projects with feasibility study approval, two will start very small. One involves spraying a biodegradable reflective surface polymer film of calcium carbonate to reflect solar radiation, while the other would pump cooler water from depths of 10 to 30 metres to ease the heat stress of surface corals. 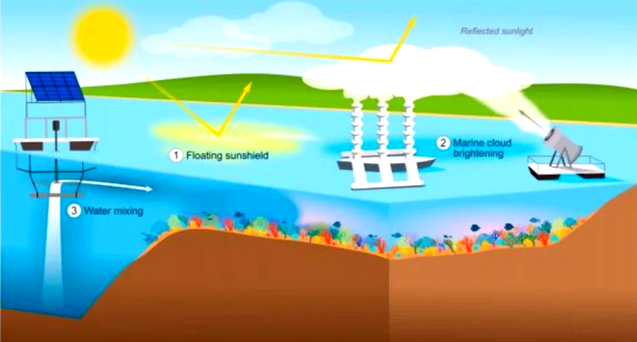 The third proposal would see microscopic salt particles propelled into low-lying marine clouds to increase their reflectivity and reduce the amount of solar radiation reaching the sea surface. "Australia currently has no national law or policy governing geoengineering or solar radiation management, or even on how such activities might fit within national climate response strategy," the paper notes. Jan McDonald, a professor of environmental and climate law at the University of Tasmania and the paper's lead author, said the "prognosis [for the reef] is looking pretty grim", with scientists estimating most of the world's corals will be lost even if global warming is kept to the low end of the Paris climate goal of 1.5 to 2 degrees. As a result, it is inevitable climate interventions will be tried even without dodging our "serious obligation to reduce carbon dioxide", Professor McDonald said. The experience in Britain, where a government-funded project aimed at assessing the feasibility of injecting particles into the stratosphere was halted in 2012, suggested public consultation and transparency were needed at the start,'' she said. Without that, the public trust in regulators or the research would be lost, "probably a dangerous path to go down". "Australia has the opportunity to do the right thing by the Great Barrier Reef but also to provide a model of good governance for other countries grappling with this issue," Professor McDonald said. Labor environment spokesman Tony Burke said: "We are the custodians of the planet’s most precious and most vulnerable environmental asset. "If we win the election, then we would listen to the experts both on individual projects and the overall framework for protecting the Great Barrier Reef." 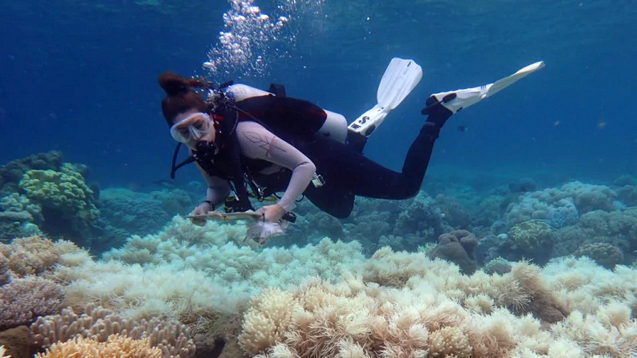 Greens spokeswoman on the Great Barrier Reef Larissa Waters noted that a Nature paper published last week found 89 per cent of new corals were not surviving. "[That] made it clear restoration and other projects aren’t enough – there must be urgent action to reverse climate change," Senator Waters said. "There should be an assessment framework for geoengineering experiments to ensure new problems aren’t being created." CLOSED JOINT-STOCK COMPANY AGS OIL is one of the leading Oil & Gas trading companies in Russia Federation with good business reputation and well experienced in the Petroleum and mining sector. We offer the following trades through our reliable Refineries: D2 DIESEL OIL GOST 305-82, JP54 AVIATION KEROSENE COLONIAL GRADE, UREA 46%/PRILLS, LNG, LPG, REBCO, MAZUT100 GOST 10585-75/99, AUTOMOTIVE GAS OIL(AGO). We as well secure allocations from our various Refineries for our numerous buyers who are interested in Spot transactions on FOB/CIF deliveries to any world safe port (AWSP). Our Refineries have their products both at Russian ports and Rotterdam port. we also have a reliable SHIPPING COMPANY if you are in need of find the contact bellow.